Mark Attwood discusses rolling up a plate with Pontsho Sikhosana. 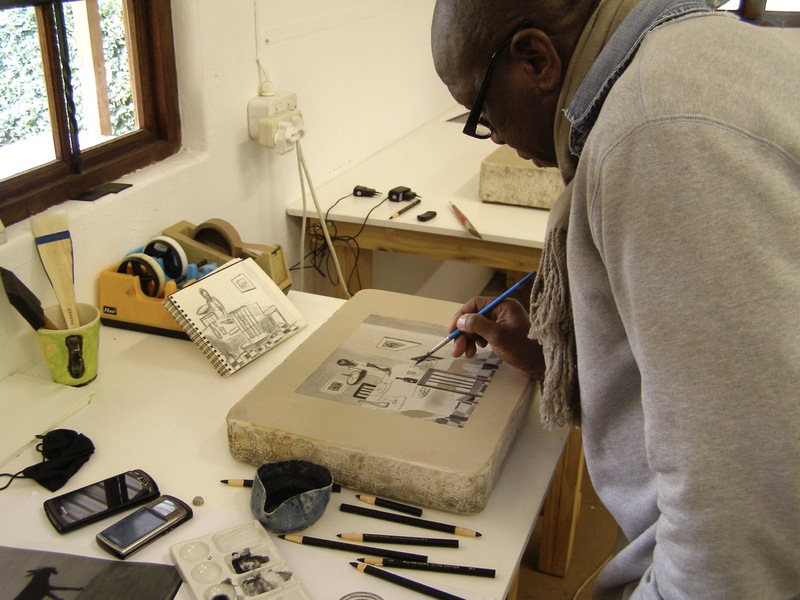 Sam Nhlengethwa working on a litho stone. Lithography is a planographic printing process and the word is derived from the Greek word meaning to write on stone. Aloys Senefelder invented lithography in 1798. In lithography the printed and non-printed areas share the same surface, i.e. the plate or stone is a flat smooth surface. Lithography works on the principle of grease repelling water and adhering to greasy ink. Thus the materials that the artists use to make their image with are "greasy" and these are the areas that will pick up the ink from the roller. The rest of the plate or stone surface is covered with a thin film of water, which serves to repel the ink during printing. In this way, the drawn area of the print is what is transferred to paper. For many artists, lithography appeals to them as it is very similar to drawing and painting because the artist is able to work with pencils and brushes. Lithography crayons look and feel the same as regular pencils but are prepared specifically for lithography. The artist works directly onto the grained limestone, grained film or aluminium plate. Various abrasives are used in the graining process so that a variety of either smooth or rougher surfaces can be worked on depending on the preferences of the artist concerned. Each colour used on a lithograph requires a separate plate or stone to be used and the artist has to make the colour separations themselves. The complicated technical nature of lithography takes time and knowledge to do effectively and usually requires that the artist collaborates with a skilled master printer. 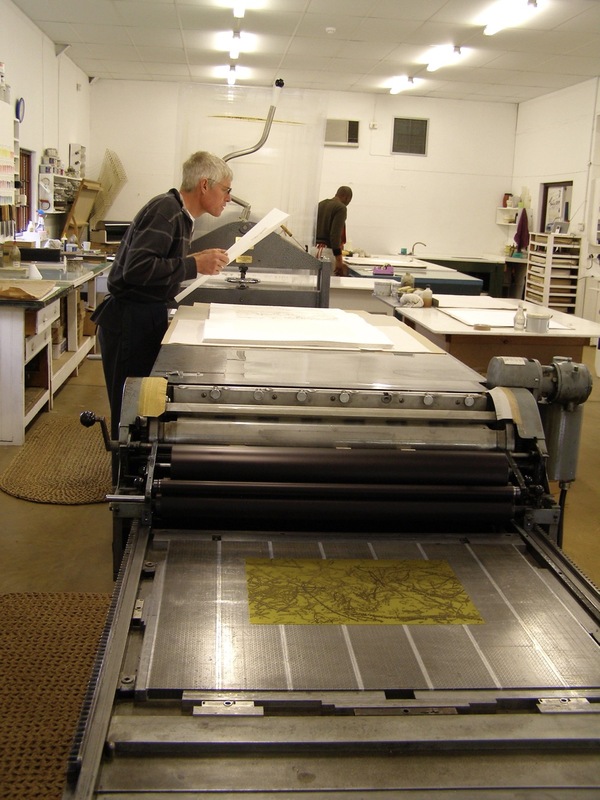 At The Artists’ Press, we focus on lithography and have a Tamarind trained Master Printer in the studio working in collaboration with artists. 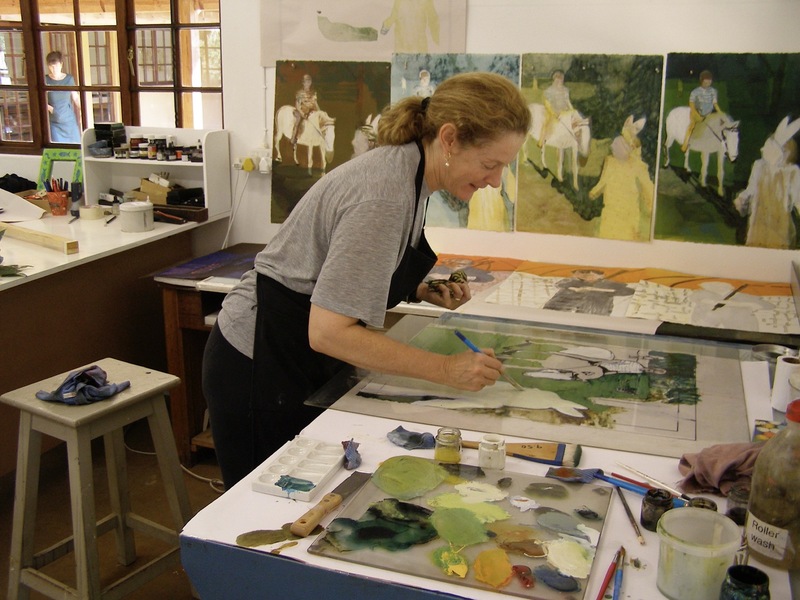 Josie Grindrod working on monotypes. 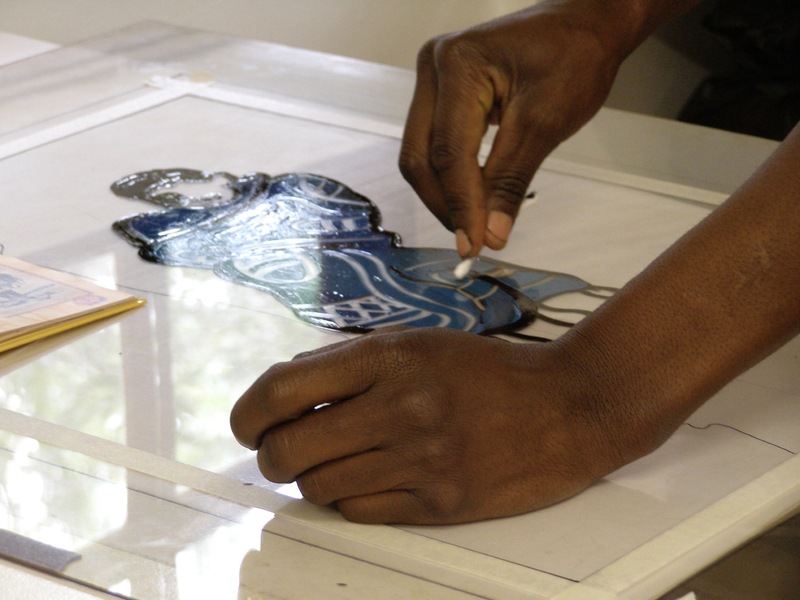 James Khoza working on a monotype. 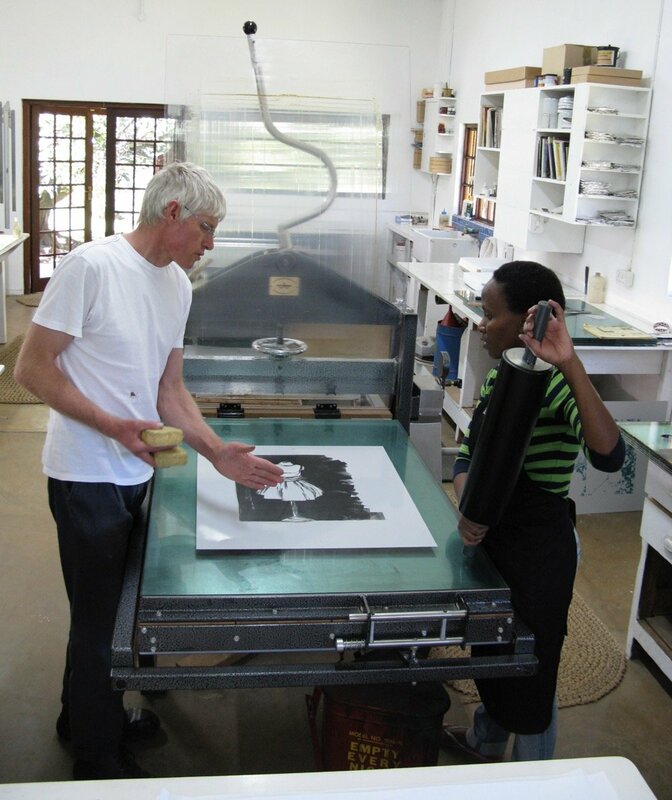 Mark Attwood printing a letter press print by Willem Boshoff. The youngest of all the printing techniques used by artists, screen printing is based on the idea of layering a number of "stencilled" areas onto a surface. It was initially a commercial process used for making posters and for printing onto fabric. Today artists use silkscreening (they used to be called serigraphs) to create work which is often bright and quite hard-edged. The images that come to mind are the large prints produced by the Pop Artists of the 1960's. The technique involves exposing an image onto treated nylon mesh (it used to be silk). The areas that will accept the ink are then washed out and a squeegee used to press the ink through the nylon. Each successive colour requires its own screen. It is a fairly simple process that does not need a press and it is fairly easy to set up a frame to ensure that the colours are registered against each other. Simon Attwood cutting a lino block. 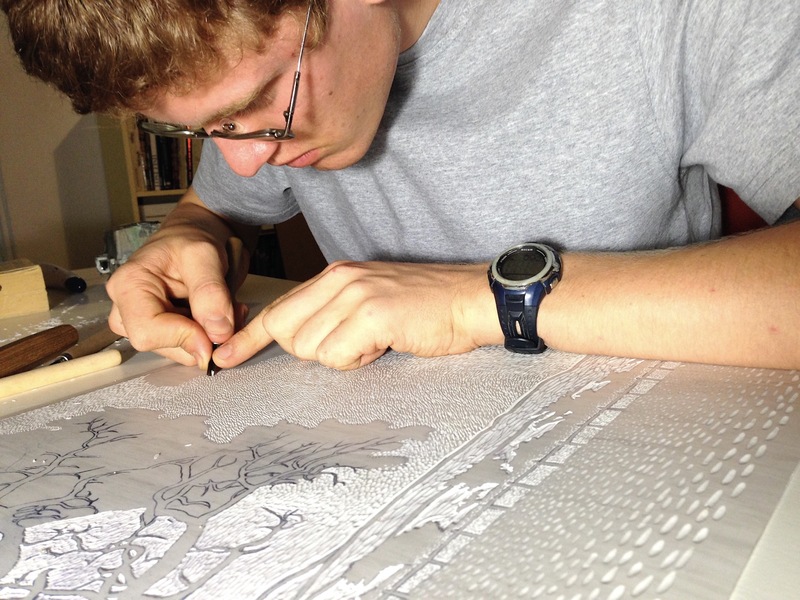 In this technique, the artist outlines their image on a wood block or other surface and then cuts away pieces from the surface, leaving only the image raised. Ink is then applied to the surface with a roller and transferred onto paper with a press or by hand burnishing or rubbing. Since the recessed, cutaway areas do not receive ink; they appear white on the printed image. Relief prints are characterised by bold dark-light contrasts. The primary relief techniques are woodcut, wood engraving, and linocut. For relief printing, a press is not essential as the paper can be placed onto the block and the image transferred by rubbing it with something as simple as a metal spoon. However using a press ensures that consistent quality is maintained throughout the print run. Woodcut is the earliest and most enduring print technique. Woodblock printing originated in China and was initially done onto fabric and only later was paper used. The oldest cloth print dates to AD 220 and the Han Dynasty. Western artists have made woodcut prints for hundreds of years, perhaps most notably in the sixteenth and the late nineteenth and early twentieth centuries. The beautiful grain of the wood is sometimes seen in such prints and is used by the artists to give their work an added dimension. Wood Engraving is made from the end-grain surface of blocks. This surface has no grain and can afford great precision and detail. Wood engravings are usually so fine and detailed that they do not accommodate many colours. Linocut is printed from linoleum (a material that is available from most good art material supply shops), the artist often backs this with wood for reinforcement. 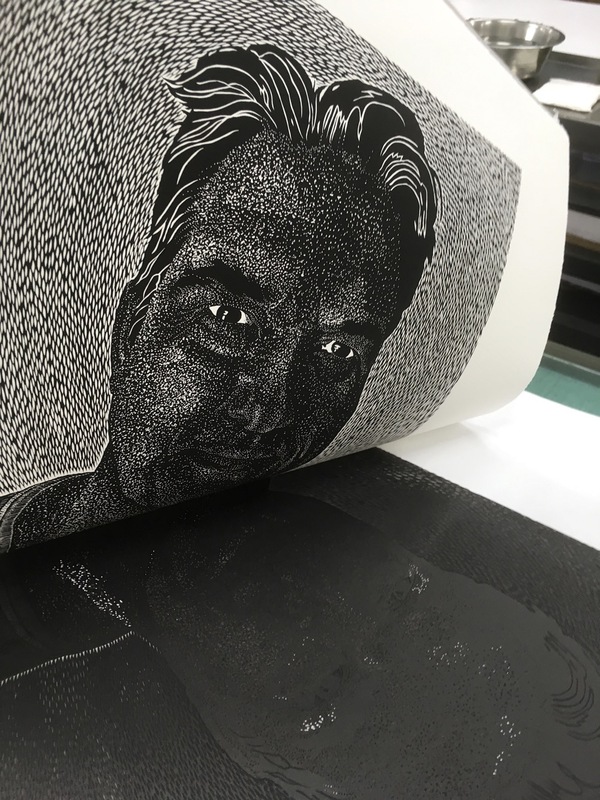 The printed surface has less texture than in a woodcut because of the supple nature of linoleum (which is made easier to cut if it placed in the sun to heat up). The lino takes all types of lines but is most suited to bold designs with contrasting tints. The best material to use for lino cuts is Tarkett homogenous vinyl sheeting. It is sold through companies that sell flooring material, it is best to buy it in a light colour. After it has been inked up for the first time the ink can be wiped off with a rag and not solvent, ensuring that a thin film is left on the surface which enables the artist to work on their block more accurately. Reduction lino prints are coloured lino prints where the artist cuts the block further which each colour printed so that the final image is built up of colour overlays. The contemporary Bushman artists at The Kuru Art Project have perfected this technique. Simon Attwood portrait of Stuart Trent being pulled off the block. Intaglio comes from the Italian word intagliare, meaning, "to incise." In intaglio printing, an image is incised with a pointed tool or "bitten" with acid into a metal plate, usually copper or zinc. The plate is covered with ink and then cleaned so that only the incised grooves contain ink. The plate and dampened paper are run through a press to create the print. Usually, the plate is smaller than the paper, so that the impression of the plate, or the plate mark, remains on the paper, creating the embossed look that so many people associate with fine prints. When a limited edition of impressions has been printed, the plate is usually defaced with gouges or holes to ensure that it cannot be used again. The intaglio family of printmaking techniques includes engraving, drypoint, mezzotint, etching, and aquatint. Engraving is a process in which a plate is marked or incised with a tool called a burin. As the burin moves across the plate, copper shavings, called burr, are forced to either side of the lines being created and are usually cleaned from the plate before printing. An engraved line has a sharp and clean appearance. Scratching a drawing on the plate with a needle creates drypoint prints. The incised lines of a drypoint are shallower than those in an etching, and in this technique, the burr is not scraped away before printing. The result is characterised by heavier, softer-looking lines than those in an engraving. As the plate wears down quite quickly as a result of the scratching being relatively shallow drypoint editions tend to be small in number. Collographs use a variety of materials to create the print or collage block. Lace, string, paperclips, keys, feathers... Almost anything can be used as long as the pressure on the press is not too high as this can result in the blankets and rollers getting damaged. Collographs are usually quite textured prints as the harder objects get embossed into the paper. Mezzotints have soft tonalities ranging from grey to black. In this method, the entire surface of the plate is roughened by a spiked tool called a rocker, so that, if inked, the entire plate would print in solid black. The artist then works from "black" to "white" by scraping (or burnishing) out areas so that they do not hold ink, yielding the mezzotint's soft modulated tones. Etching has been a favoured technique for artists for centuries, thanks largely to the ease with which an etched image is created. An etching begins with a metal plate (usually copper) that has been coated with a waxy substance called a "ground." The artist creates his or her composition by drawing through the ground to expose the metal. The plate is then immersed in an acid bath, which "bites" or chemically dissolves the exposed lines. For printing, the ground is removed, ink is introduced into the incised lines, and the plate is wiped clean. The plate is covered with dampened paper and run through a press under great pressure in order to force the paper into the lines, resulting in the raised characteristic of etching. Aquatint is an etching process in which the artist is concerned with tone rather than line. For this technique, a plate is covered with particles of an acid-resistant material such as resin and heated to make the particles stick. The treated plate is then placed in an acid bath, which bites into the copper that is exposed between grains of resin, yielding a composition marked by texture and tone. Photogravure is an intaglio plate making process in which an image is photomechanically transferred from the plate onto an intermediary, such as a roller, and then onto paper, resulting in a final printed image that is not reversed. Chine collé is a method of applying thin paper onto paper that then has the image printed on top of it. Chine collé allows for added colour or tonal definition in the print. All of the above printing techniques can be used in isolation or combination with each other, allowing for an almost limitless range of artistic expression.